In their roles as both landlords and employers, health and safety must be top-of-mind for Ontario's non-profit housing providers. On this page, you'll find a number of resources designed to help you meet your legal obligations under the Occupational Health and Safety Act, and to build safer, healthier environments for your staff and your tenants. Have a look at the free preview to see what's included, or purchase the Guide and accompanying resources in the ONPHA store. ONPHA's InfoON series tackles the problems and challenges housing providers face the most, outlining best practices, practical approaches and solutions. These straight-forward resources are a great place to start to learn about key areas of housing management, and they are available exclusively to housing members at no cost. Have a look below at our health and safety related InfoONs. Health and Safety Programs for Housing Providers: Outlines basic health and safety requirements that housing providers must be aware of. Health and Safety and Canada's Criminal Code: Outlines the implications of Bill C-45 on housing providers as it relates to health and safety. Bill C-45 facilitates prosecution and sentencing of organizations that don't take reasonable measures to protect the health and safety of workers and the public. Understanding Workplace Safety and Insurance Premiums: Learn how and why the Workplace Safety and Insurance Board (WSIB) classifies employers the way they do, and why it's important to be classified correctly. Early and Safe Return to Work: How to facilitate an employee's return to work after a workplace injury. Occupational Health and Safety Act, Under Five Employees: Helping small housing providers (with under five employees) meet their legislated health and safety requirements. Confined Spaces: Guidance on the requirements of the confined space provisions in the Regulation for Confined Spaces (O. Reg. 632/05) under the Occupational Health and Safety Act. ONPHA is a proud participant in the Public Services Health & Safety Association's (PSHSA) Affiliate Program, to empower ONPHA member organizations to increase their health and safety awareness and help protect the health and safety of their staff and communities. ONPHA housing members have access to a dedicated portal of PSHSA resources designed to help them meet their health and safety requirements. 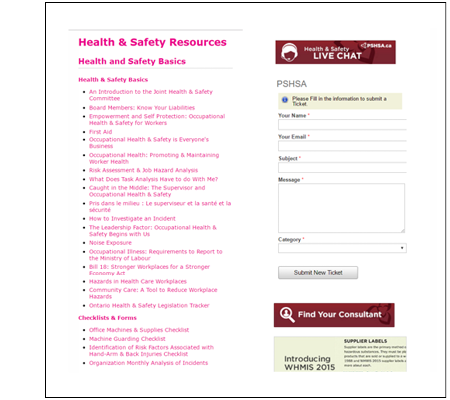 From helpful info sheets and backgrounders, to checklists, toolkits, forms and a series of webinars and video tutorials on key health and safety topics for housing providers, it's a great way to tap into PSHSA's leading health and safety expertise. *To access the portal, you must be logged into the ONPHA website using your housing member login, and be using one of the following browsers: Internet Explorer, Microsoft Edge, or Google Chrome. 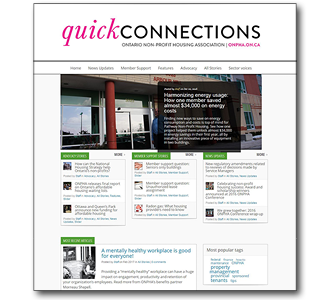 The April 2017 edition of ONPHA's Quick Connections digital magazine focused in on health and safety concerns for non-profit housing providers. Browse some of the articles below for quick reads on important health and safety topics. Out with the old, in with the new: Moving to WHMIS 2015: Learn about what changes you can expect and how you can remain compliant during the transition period from WHMIS 1998 to WHMIS 2015. The lone worker: Find out what the law says about working alone and how to protect yourself and others. Dealing with 'sharps' in your community: Do you know what to do when you find a needle, syringe or other 'sharp' in your community? Act now to prevent future workplace injuries: Learn how to protect workers from common injuries before they become serious health and safety concerns in the future. Fire safety: What to include in safe work procedures: Housing providers need to have safe work procedures in place in order to prepare staff to effectively participate in fire prevention. Read these tips on what to include. Electrical safety: Is it time to review your procedures? Safe work procedures will help you prevent accidents and avoid significant fines. Read more about how you can ensure your procedures on electrical safety are compliant.